The Compassionate (ar-Rahman), the Holy (al-Quddus), the Source of Peace (as-Salam), the Supreme (al-Mutakabbir)…these are just a few of the 99 Names of God to be found in Islam. It has been said that knowledge of Allah’s Beautiful Names is the greatest knowledge a human being can possess. We are so delighted that this absolutely lovely rendering of the 99 Names has arrived in publication. In its presentation it is so accessible, gentle, and opening for the heart for both children and parents, and extended family, who might study these Names together, reflecting on the qualities they evoke. Teachers and students of Islam and comparative religion can greatly benefit from this beautiful guide. It presents a well-balanced view of Islam through the Names of God as expressed through the Holy Quran and opened in meaning through accompanying words of the saints. This project fills such an obvious need, and does it so beautifully, one wonders why it hadn’t happened until now. Probably so that exactly these people would be the ones to do it. 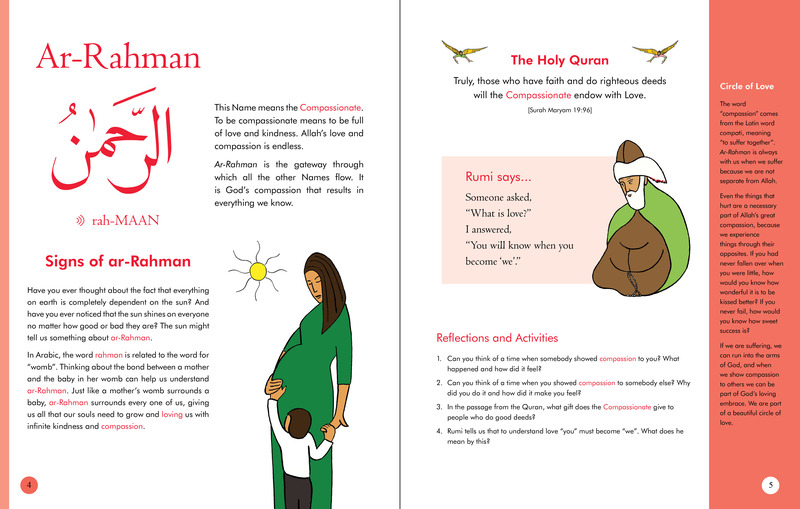 It provides an entry point into a spiritual Islam that every parent would like to give to their children, and illuminating their own understanding in the process. Inshallah, it will be recognized as a classic.